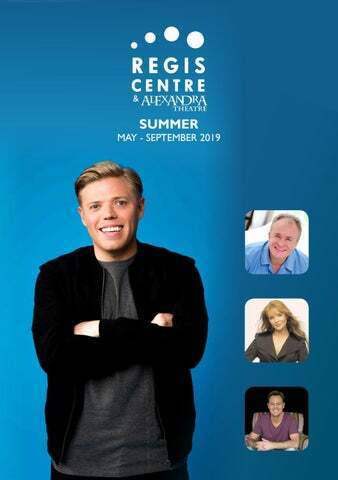 WELCOME We have a jam packed summer season for you here at the Regis Centre and Alexandra Theatre. Filled with famous faces, exciting musicals, laugh-out-loud comedy and popular music, we are certain there is something for everyone this Summer. We are ecstatic to be welcoming comedian Rob Beckett (page 5) here on Thursday 9 May. After the huge success last year with Joe Pasquale, Live at the Regis (page14 and 15) will return this summer. This year our headliner is legedary entertainer Bobby Davro, with support from ventriloquist Max Fulham and vocalist Riley Clark. With comedy, stunning vocals and breathtaking dance numbers, this yearâ&#x20AC;&#x2122;s show is certain to be a highlight of our summer season. 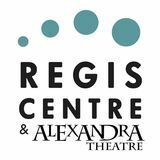 Here at the Regis Centre, we understand that some of our audiences prefer a matinee performance and so we have programmed a number of exciting events during the daytimes. These include The Magnificent Music Hall (page 9) with variety favourite Jan Hunt, The Royal Marines Association Concert Band (page 10) and three matinee performances of Live at the Regis. Whether itâ&#x20AC;&#x2122;s popping in for a quiet coffee or just coming to see one of our many productions, we look forward to welcoming you to the Regis Centre soon! EAT & DRINK Situated a few steps away from the seafront, our Café is the perfect location for a freshly ground coffee, light snack or delicious cake. Stay as long as you like, use our free Wi-Fi, read the paper and relax. Whether it’s meeting friends, taking a break or relaxing before seeing a show, our Café is the ideal place. THEATRE BAR Don’t forget to grab a drink prior to the show, or pre-order something for the interval on your next visit. You’ll find all sorts of little gems in our Charity Shop which is situated across the Place St. Maur. We have everything from books, games and toys to clothes and curiosities. All proceeds go towards the theatre so pop in anytime and see what we have to offer. We also welcome donations. TICKETS £25.50 Join an all star cast of Ireland’s most talented performers including Frank Mc Caffrey, Kathy Durkin and David James who will be accompanied by the fabulous Keltic Storm band and world champion Keltic Fusion Irish dancers for an unmissable “Pride of Ireland Show“ that will take you on a journey through the decades of a globally loved culture. The show will feature all the well known ballads and singalongs like ‘Dirty Old Town’, ‘The Town I Loved So Well’, ‘Tell Me Ma’ and ‘The Irish Rover’ to name a small few. Add to that, a string of hilarious stories and jokes from our award winning comedian Gary Gamble and top it off with energetic reels and jigs from the world champion dancers, if it’s Ireland you like then this is the show for you! After performing over 100 shows around the UK, Jason is delighted to announce he is adding a fourth and VERY FINAL leg of his Amazing Midlife Crisis tour. This is a tour with a twist! These intimate evenings will be a unique opportunity to see him like you’ve never seen him before! Celebrating his 50th birthday and with a wealth of tantalising tales under his belt, this autobiographical show will zigzag back and forth through his life, with stories about Neighbours, Ten Good Reasons, Kylie, Joseph, I’m A Celebrity, Strictly and much, much more. Hear some new stories (and possibly one or two you’ve heard before!) plus some of the songs you know and love for a night like no other! 14+ (Parental Guidance) Likely to be swearing and adult content With support from Mark Simmons. Come and join Rob as he tries out new material! “a relentlessly smiley, perpetually grinning Londoner whose unshowy, unpretentious but thoroughly funny shtick has every chance of winning him a big audience…” - The Guardian Rob Beckett burst onto the comedy circuit only five years ago but within his first year he had won four new act competitions including ‘Amused Moose Laugh Off 2010’, ‘Outside The Box New Act of the Year 2010’, ‘Leicester Square Theatre New Act of the Year 2009’ and ‘Reading Comedy Festival New Act of the Year 2009’ as well as being nominated for the prestigious Adelaide Fringe Best Newcomer Award 2011. Missed out on tickets this time? Then sign up to our email mailing list via our website to get lastest news. Or why not follow us on Facebook, Twitter or Instagram? THURS 16 - SAT 18 MAY 7.30PM, 3PM SATURDAY MATINEE TICKETS £14 FULL PRICE £12 CONCS / £8 NUS From the award winning team, Lynn Ahrens and Stephen Flaherty (‘Ragtime’, ‘Once On This Island’, ‘Seussical’, ‘My Favorite Year’) comes the hilarious murder-mystery farce, LUCKY STIFF! Based on the novel ‘The Man Who Broke the Bank at Monte Carlo’ expect an offbeat, laugh out loud experience complete with mistaken identities, six million bucks in diamonds and a mobile corpse! The story revolves around an unassuming English shoe salesman who is forced to take the embalmed body of his recently murdered uncle on vacation to glitzy Monte Carlo. Should he succeed in passing his uncle off as alive, Harry Witherspoon stands to inherit $6,000,000. If not, the money goes to the Universal Dog Home of Brooklyn... or else his uncle’s gun-toting ex! Featuring a high energy, tuneful Flaherty and Ahrens score, ‘Lucky Stiff’ has delighted audiences all over the world.Created by the team who brought you ‘Merrily We Rolled Along’ last year! TICKETS £24.50 FULL PRICE £22.50 CONCS Now seen by over 3,000,000 people. Cheekier, funnier and as spectacular as ever, this amazing show has been touring the UK for 21 years since it was created for the world famous Edinburgh Festival. A cabaret like no other cabaret performed by girls like no other girls. Featuring 16 of the world’s most beautiful and stunning showgirls - who just happen to be men! Their all new production for 2019 is bigger and as glitzy and glamorous as ever, prepare for a night you’ll talk about for years, laugh and sing your heart out with hundreds of friends you’ve yet to meet! The Ladyboys Of Bangkok is coming to the Alexandra Theatre with the biggest party in town. THURS 6 & FRI 7 JUNE 7.30PM, 1PM FRI MATINEE TICKETS £10 FULL PRICE £8 CONCS Crescendo is the eclectic new repertoire of works presented by Chichester College dance students. This show encompasses a diverse range of dance styles from jazz to contemporary and physical theatre. The dancers are studying on vocational training programmes and will be presenting work they have developed with professional choreographers, dance lecturers and their own choreography. Sit back an enjoy an evening of enetertainment with tributes to four of the biggest names in American music. From the company that brought you ‘Boogie Nights’ last year, comes this musical theatre classic. Opening with the beautiful Eva Cassidy arrangements of such classic songs as ‘Somewhere Over The Rainbow’, ‘Songbird’ and ‘What a Wonderful World’. The show then bursts into a rowdy tribute to the great Johnny Cash with ‘Walk The Line’, ‘Ring Of Fire’, ‘Jackson’ and many more. Kipps and Ann were childhood friends. When they were parted as children, Kipps cut a sixpence in half and told Ann to look at it whenever she missed him. Years later, Kipps is working as an apprentice in a draper’s shop in Folkestone. Ann arrives in the town, looking for him. They meet and re-kindle their childhood friendship. Then everything changes. After the interval you will be mesmerised by an enchanting set of Barbra Streisand classics featuring ‘Evergreen’ and ‘Don’t Rain On My Parade’ finishing with the stunning duet ‘You Don’t Bring Me Flowers’. The evening will be brought to an end with all the famous Neil Diamond hits including ‘Love On The Rocks’, ‘Forever In Blue Jeans’ and, of course, ‘Sweet Caroline’. All this in one evening makes it a show you don’t want to miss! TICKETS £15.50 FULL PRICE £13.50 CONCS In what promises to be an unmissable and very special evening, The All Things Must Pass Orchestra returns to the Alexandra Theatre. The Brighton-based 10-piece band, led by singer and multi-instrumentalist Alex Eberhard, has devoted itself to bringing to the stage the music of George Harrison in all its ingeniously kaleidoscopic and inspirational glory. The set consists of a fascinating selection of songs from Harrison’s incredibly diverse musical output: Celebrated masterpieces such as ‘Something,’ ‘While My Guitar Gently Weeps’, ‘Here Comes The Sun’ and the anthem ‘My Sweet Lord’ are interspersed with rarely heard gems from four decades of sublime songwriting – all hand-picked and performed with love and attention to detail by the All Things Must Pass Orchestra. Featuring luscious three-part harmony vocals, electric and acoustic guitars, a superb horn section and a super-tight rhythm section, the band is able to interpret and bring to life the “Quiet Beatle’s” richly textured music as it is heard both on landmark recordings from the Beatles years, as well as the proliﬁc post-Beatles-era, which includes the eponymous triple album All Things Must Pass. Book your tickets early – the ATMPO’s show tends to sell out quickly! TICKETS £15.50 FULL PRICE £14.50 CONCS This experienced and thoroughly entertaining band has played to enthusiastic and sell-out audiences for many years by providing a wide spectrum of music to suit all tastes. The Royal Marines Association Concert Band is comprised of over 50 talented musicians who boast a total of 1,800 years’ Service to Queen & Country. They will provide a programme of popular marches, big band sounds, musical theatre, music from film, radio and TV shows as well as favourites from the classics. The concert will also feature a typical Royal Marines finale. TICKETS £15 FULL PRICE £7.50 UNDER 25s With the beautiful 60 Minute Orchestra A night of famous opera extracts and overtures to include Mozart, Rossini, Bizet,Verdi, Saint-Saens and other famous composers. Presented by Roger Clayden, conducted by Mark Fitz-Gerald. Jonathan Strange leads the professional string orchestra. High-quality soloists. Ticket price includes free programme and a free glass of red or white wine or orange juice. TICKETS £23 As time goes by Mary Duff’s career seems to go from strength to strength, and as the salutation and success continue to roll in for the genuinely charismatic and warm Irish singer, there seems little sign of the celebrated triumphs slowing down. Quite the opposite in fact, as she is about to enter, what is hoped to be, one of the most exciting phases of her career so far continuing a hugely successful number of years which has heralded previously unthought-of achievement for the lovely Irish artist. Not only has Mary made a live television appearance in front of a massive 60 million American viewers, resulting in a number 2 on the Billboard World Music Charts, but success has also grown in the UK. Her album, ‘The Ultimate Collection’, a ‘best of’ album featuring 40 of Mary’s’ best loved songs, was not only her first TV-advertised release, but was also her first ever British chart hit, nestling nicely into the UK Top 50. Not bad for a small country girl from Ireland, who’s wonderfully emotive, yet quietly powerful voice, was all discovered by accident when she was only twelve years old! This year will see Mary bring her show to many parts of the World, including Australia, New Zealand, Sri-Lanka, Switzerland, USA, Canada and all parts of the British Isles. featuring show stopping performances from The Bersted Community Choir, The Bersted Boys and a number of invited special guests, this fabulous evening of pure entertainment is guaranteed to put you in the party mood! TICKETS £10 FULL PRICE / £8 CONCS Come and join in the birthday celebrations as Bersted Arts turns five! TICKETS £19 FULL PRICE / £18 CONCS Back by popular demand, TV and West End Star Ben Richards is back in his home town, for one night only. Singing songs from his musical heroes spanning the years. From Frank Sinatra to Bruno Mars, with a nod to his musical career. This is a night not to be missed. Ben is an actor and singer, best known for his numerous appearances on some of Britain’s most popular television show, and for his starring roles on stage. Ben’s extensive TV credits include Ben Bradley in ‘Hollyoaks’, PC Nate Roberts in ‘The Bill’ and Justin Fuller in ‘Holby City’. In the West End, Ben has played lead roles in ‘The Bodyguard’ (Dominion Theatre); ‘Priscilla Queen of the Desert’ (palace Theatre); ‘Guys and Dolls’ (Piccadilly Theatre and UK tour) and ‘Grease’ (Victoria Palace Theatre and UK tour). COURSE FEE £140 / £120 SIBLINGS £110 ARTY STUDENTS Are you between 8 - 16 years old? ARTY enables young people between the ages of 8 and 16 to get involved in drama, providing a broad range of high quality theatre experiences in a positive and supportive environment. Working towards performances in the Alexandra Theatre, young people can develop their skills, not only in theatre and performance but also in confidence, communication and creativity working with theatre industry professionals. Come along for a free first session and find out more. Do you have a passion for drama, either performing or backstage? Work under the guidance of a highly skilled professional team on this one week course and put on a show in just a week! This not-to-be-missed workshop is the only summer drama school in the local area that finishes with a show on a professional stage. Rehearse and perform a show in a professional theatre with costumes, scenery and lights! If being on stage is not for you, the course also covers prop-making, scenery design, costume design and lots more that goes on behind the scenes. Learn new skills, make new friends and perform on a professional stage! LIVE AT THE REGIS is one of the few true variety shows in Britain, showcasing live variety acts at their best. Featuring comedy, spell binding performances, ventriloquism and spine tingling vocals, together with a company of dancers and an onstage live band, this summer spectacular is certainly not to be missed. BOBBY DAVRO - Versatility is the key to Bobby’s longevity as a high profile entertainer. Be it in television, pantomime, festivals or musicals, Bobby Davro is one of the most versatile and experienced celebrity comedians. Laughs will be guaranteed! This year back by popular demand will be MAX FULHAM. After the success of last years variety performance we are really excited to see what he has in store for us this year! In a show that harks back to the glory days of summer at the seaside, this top class variety performance will showcase the best in professional and local talent. The musical and semi-autobiographical celebration of the Big O’s musical legacy is quite simply unmissable, as Barry Steel takes you on this specially revamped musical journey in time, from the earlyt sun years right to the late 80s and the internationally acclaimed concert ‘The Black and White Night’. The show also pays homage to the time Roy Spent with the Traveling Wilburys. Add to the mic star guests celebrating the music from legends Roy actually toured and performed with, backed by our fabulous musicians and singers and you have yourselves an incedible fusion of 60’s solid gold classics and 80’s contemproary musical genius. PERFORMED BY THE BOHEMIANS SAT 14 SEPTEMBER 7.30PM TICKETS £25 The Bohemians have been paying homage to the world’s most theatrical and dramatic Rock band, Queen since 1996, and in that time have had a huge impact on audiences across the world. Front man and pianist, Rob Comber’s outrageous stage antics and personality makes him perfect to play an uncannily realistic ‘Freddie’ with just the right look and stage persona. Rob is joined on stage by an enormously talented band including Christopher Gregory who brings all the electric guitar virtuosity required to play a very convincing Brian May. Their attention to detail is truly impressive. For over four decades’ millions of fans have been enjoying the music of Queen. The band released a total of 18 number one albums, 18 number one singles and 10 number one DVDs with estimates of their record sales ranging from 150 million to 300 million records. TICKETS £21 FULL PRICE £24 PREMIUM SEATS (first 5 rows) Remarkably compelling, amazingly detailed and always humorous. The popular star of TV’s Street Psychic, Psychic Private Eyes and Psychic Academy, Tony Stockwell has a long established credibility as one of the top Intuitive Mediums and has shared the stage all round the world with international mediums such as Colin Fry, James van Praagh and Lisa Williams. Tony demonstrates his belief that those who have passed can communicate with their loved ones with detailed messages frequently including names, dates and locations and all delivered with emotion, sensitivity and empathy. The evening may include psychometry, photographs readings and psychic prediction. FRI 27 - SAT 28 SEPTEMBER 7.30PM TICKETS £14 FULL PRICE / £12 CONCS UNRSERVED SEATING IN THE LITTLE ALEX Concluding Bersted Arts birthday celebrations James, Will and Michael return to the intimate setting of the Little Alex Theatre and this time they are bringing friends! An evening of Musical entertainment featuring songs from West End to Broadway and beyond. Join the boys for “One Last Song” this September. MON 30 SEPTEMBER 7.30PM TICKETS £24 Undoubtedly one of the finest guitarists the world has ever seen, Double Grammy Award Winner Albert Lee is also an accomplished piano player and has a fine singing voice. He has a soulful voice but can equally ‘tear it up’ rock ‘n roll style. Co-writer of ‘Country Boy’ and writer of many other great songs, always in great demand by other artistes, he has played on countless sessions worldwide. He has appeared and recorded with many of the finest artistes in the music industry, including Glen Campbell, Dave Edmunds, Dolly Parton, Bobby Bare, Joan Armatrading, Ricky Scaggs, Joe Cocker, Willie Nelson, Linda Ronstadt, Rodney Crowell,Vince Gill, Travis Tritt, The Blue Caps, Robert Wells and Earl Scruggs. Albert was a member of The Everly Brothers Band, Emmylou Harris’s Hotband and Bill Wymans’ Rhythm Kings and toured extensively with them. He also toured with his own band, Hogan’s Heroes for many years. In 2017 Albert was awarded a trailblazer award by the Americana Society of the UK. FRI 4 OCTOBER - 7.30PM TICKETS £20.50 Electric Strings & Beatbox - Classy musicianship, comedy timing and a contemporary sound. FRI 25 OCTOBER - 7.30PM TICKETS £23 The Take That Experience are one of the finest tributes to Take That across the UK and Europe. WEDS 30 OCTOBER - 6PM TICKETS £15.50 The UK’s number one tribute to global superstar Ariana Grande and kids’ sensation JoJo Siwa together in the most exciting new Pop production of 2019! FRI 1 NOVEMBER - 7.30PM TICKETS £21.50 Now seen by over 250,000 fans, “The Legends of American Country“ returns for another fantastic night of toe tapping Country classics . SUN 24 NOVEMBER - 7.30PM TICKETS £17 FULL PRICE / £16 CONCS Swing into Christmas with the unique Five Star Swing. FRI 29 NOVEMBER - 4PM TICKETS £10.50 / £40 FAMILY TICKET The show where every child gets a present from Santa! Journey to the wonderful world of Oz with Dorothy, the Scarecrow, the Tinman and the Cowardly Lion in this spectacular pantomime adventure. Fun for the whole family. Please check our website for times and prices. BOOKING INFORMATION Box Office Tel: 01243 861010 Book Online: www.regiscentre.co.uk Box Office Hours: Monday to Saturday 10am - 4pm or one hour before the start of each performanc Payments: We accept cash, cheque, theatre tokens and all major credit and debit cards. Please make cheques payable to Arun Arts Ltd. Booking fees: We charge a 50p per ticket booking fee which is included in the ticket price. We charge £1 if you would like your tickets posted. There is also a charge of £1 for reprints/exchanges. Concessions: One discount per ticket applies. Concessions may include senior citizens, students, under 16s or registered disabled patrons. Appropriate ID required. Offers cannot be applied to previously purchased orders or in conjunction with any other offers. The Management reserve the right to amend the programme as necessary. Situated on the seafront, the Regis Centre offers an ideal venue for performances, meetings, classes, rehearsals, conferences and exhibitions in the heart of Bognor Regis. Please mention your requirements at the time of booking and don’t hesitate to ask the Duty Manager if there is anything you need on arrival. Parking: There are four parking spaces for blue badge holders at the front of the Centre and additional blue badge bays in the public car park next to the Centre. Hearing Impaired: There is a hearing loop in our auditorium. Assistance Dogs: We welcome assistance dogs in all areas of our building. Please talk to our Box Office staff about any special requirements when booking. Auditorium: Row J has 4 permanent wheelchair spaces. Wheelchairs spaces can be booked in person or over the phone at our Box Office. Row J is also suitable for patrons with walking difficulties. Due to our licensing regulations, we are unable to permit the transfer from wheelchairs to theatre seats. Our spaces are highly versatile and can be tailored to your needs. These include our three studio spaces, airy and spacious foyer area, the wonderful 353 seat Alexandra Theatre and the Little Alex - a 60 seat studio theatre situated on the stage of the Alexandra Theatre. For more information on hiring our spaces please contact us on 01243 867676. The Regis Centre prides itself on being a community venue for local societies and non-professional companies. We do not accept responsibility for the quality, content or pricing for these events. The Regis Centre is run by the charity Arun Arts Ltd. and relies heavily on the help of our dedicated volunteers.Volunteering can be a great way to give back to your community and meet new people but it can also open up a door to opportunities though gaining new skills and experience. Get involved with the following areas: • Front of House • Box Office • Café • Charity Shop • Maintenance and more If this is something you’re interested in, why not pop in to have a chat, contact us on 01243 867676 or fill out one of our Volunteer Application Forms online at www.regiscentre.co.uk.